The final game of Gretzky's career was a 2–1 overtime loss to the Pittsburgh Penguins on April 18, 1999 in Madison Square Garden. The national anthems in that game were adjusted to accommodate Gretzky's departure. In place of the lyrics "O Canada, we stand on guard for thee", Bryan Adams ad-libbed, "We're going to miss you, Wayne Gretzky". "The Star-Spangled Banner, as sung by John Amirante, was altered to include the words "in the land of Wayne Gretzky. "Gretzky ended his career with an assist, assisting on the lone New York goal scored by Brian Leetch. At the time of his retirement, Gretzky was the second-to-last WHA player still active in professional hockey, Mark Messier, who himself attended the game along with other representatives of the Edmonton dynasty, being the last. 5:55 p.m. - Gretzky leaves the ice for a player change early in overtime, marking the final shift of his glorious career. Moments later, Jagr scores the winning goal with 3:38 left in sudden death, ending Gretzky's career. 5:56 p.m. - All the Penguins shake Gretzky's hand. He gets hugs from former teammate Don Jackson, a Pittsburgh assistant coach, from Jagr, who apologizes for ruining his day, and from Kovalev. 6:03 p.m. - The Garden erupts as Gretzky returns and begins to take a lap around the rink. Fittingly, some people begin throwing hats at the man who had more hat tricks than anybody in NHL history. He picks up a Yankees hat and puts it on, then goes to the glass to shake hands with a number of children reaching over from the seats. 6:07 p.m. - Ex-Ranger Ulf Samuelsson, who flew in from Detroit, surprises Gretzky at the door near the benches. Gretzky begins to cry again as they hug. 6:08 p.m. - Gretzky puts his arm around Leetch and brings the whole team for a lap around the rink. He visits Christopher Reeve, in his wheelchair at the Zamboni entrance. By now, Gretzky's emotions are all joy. 6:10 p.m. - Gretzky hugs his wife Janet and his dad Walter, and leaves the ice with his family. 6:12 p.m. - Another curtain call. Gretzky returns to a dark rink, covered by a spotlight. 6:13 p.m. - Gretzky leaves the ice for the final time. The red goal light at one end of the arena is flashing. Gretzky played in his final game as an NHL player on April 18, 1999. Upon his retirement, Gretzky held or shared 61 NHL records (40 for regular season, 15 for Stanley Cup playoffs and six for All-Star Game). Following his final game, the NHL bestowed on Gretzky the unique distinction of being the only player in the history of the NHL to have his jersey number retired by all member clubs. “No. 99” was formally retired at the 2000 NHL All-Star Game in Toronto and will never again be worn by an NHL player. In an emotional sendoff, Gretzky finished his career in a 2-1 overtime loss to the Pittsburgh Penguins. With Mario Lemieux, the man Gretzky calls his greatest opponent, and Mark Messier, his greatest teammate, on hand, and with national TV audiences in the U.S. and Canada watching, the Great One got one final assist. Commissioner Gary Bettman announced that the league will retire Gretzky's No. 99. 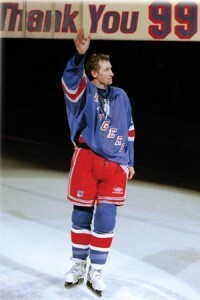 And in his last appearance on the ice, Gretzky smiled, waved to the full house at Madison Square Garden and saluted his fans through tears as his career came to an end. "I wish I could have been (Michael) Jordan hitting that last shot to win the championship . . . that wasn't going to happen," Gretzky says.